When an “inch” above the competition just won’t do, that’s when you have to go SUB MOA —and let the trigger do the talking. For hunters and target shooters, every minute of angle counts. “Going sub” can make the difference between hitting your mark, shooting with deadly accuracy in harsh weather conditions and putting dinner on the table. That’s where SUB MOA steps in, the Mountain West’s most reputable long range shooting institution. However, we’re much more than “just” a place to learn the skills necessary to improve your shot. 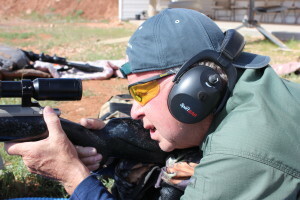 If it’s expert long range instruction you’re after, Justin Richins blends the expertise and knack for teaching necessary to make the sessions informative and enjoyable. No matter what your goals, he’ll work with you to ensure you’re not just copying the skillsets, but truly understanding them—so you’re well equipped with both the right equipment and right knowledge for your next hunting expedition. Partnered with R&K Hunting Company, Richins leads the pack of industry experts and guides, specializing in trophy elk, Shiras moose and mule deer. The old adage “Teach a man (or woman) to fish and they’ll eat for life” applies double fold when it comes to hunting. Participants in the SUB MOA institution stay at 5-star ranch resorts overlooking endless miles of picturesque mountain ranges. Enjoy 8,000 square feet of space, world class chef-prepared meals and all the luxuries of home while mastering new skills and learning from the best. At SUB MOA, we also offer customized Cerakote coating for your firearms, ensuring that not even the most challenging of trips will damage your investment. This ceramic coating safeguards your heirloom from scratches, rust, dents and dings, whether you’re tracking elk in the snow or taking on a downpour during deer season. As the region’s gunsmith leaders, our technicians repair and build firearms to the highest quality and tout years of experience. Whether you need your firearm restored, repaired, or are looking to add to your collection with a custom piece, you deserve only the best—and we always aim to please. From custom long range rifles to custom ammunition, the majority of products available at SUB MOA are handcrafted to the highest caliber. Long range scopes and range finders help you step your sport up to the next level, providing the tools you need for impeccable long range shots. Enjoy the comforts of a private shooting range, the absolute best instruction in luxurious indoor and pristine outdoor surroundings and access to the finest custom firearms and accessories on the market. SUB MOA is right on target, every time—and is in your corner to help you do the same.